On Friday morning I took a trip with my beautiful daughter to Roanoke/Salem area and we visited four spots looking for flowers for my gardens, stands, gazebo and porch. We had such a great and much overdue trip together. Those beauties will be shown in another post after they’re where they need to be and taking root. On Friday afternoon, the paint brushes came out and I spent about five hours painting the columns and wooden trim and part of the ceiling. Most of the ceiling is a very pale blue siding but it’s has a wide section that flows from the porch columns up to the siding and it’s wood. I painted it as well in the brilliant white that I put on the columns. They looked so good but while on my step ladder I realized how dirty the ceiling was and the white siding didn’t look so white so I went at them with a vengence and what a difference. Everything dried overnite while I worked in the yard on other projects and hubby built me another shelf on the entrance to the porch just like the one on the opposite post. We use these to sit our binoculars for watching wildlife on the mountain. The end results and very nice, clean porch that has been washed down, painted, weather proofed and furniture minimized and cleaned as well. Out damned spiders!! Not sure how long it will look this nice with two cats and a dog always on it and muddy feet when it rains but it is so gratifying at the moment and a little swish with a broom and a mop to wipe off tracks and we’ll be set. We’re already enjoying the evenings listening to the quiet!! 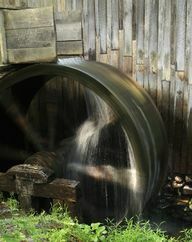 I was checking Pinterest tonight and found this site http://pinterest.com/gustavodalmasso/ who had a board of water wheels, water mills and grist mills and it was beautiful. It inspired me to show you what I made from a grist mill wheel that I salvaged from a fallen down meal on the last homesite we lived on before we moved to the farm. The mill was built soon after the house was built which if I remember correctly was 1805. Anyway, it hadn’t been used for years not had the barn on the property and every thing was built of logs. The mill roof and floor timbers were decayed really bad and it hung over Snodgrass Branch which probablyaccelerated the decay. When we were tearing apart the damaged building we found all types of milling tools, horseshoes, handmade nails and other relics of that sort which made us think there was probably a blacksmith shop on the farm also. My major find was the gorgeous, intact mill wheel. It was dirty, bruised but intact and I knew it was going to be my next project and it had to go into my house. Somewhere in all of the thousands and thousands of photos I have not scanned yet are the pictures that would completely tell the story of the reincarnation of the mill wheel. I, so far, have only been able to find one. I will try to tell in as much detail the steps I took to bring the mill wheel back to life but reincarnated as a household item. First you have to have an idea of what a mill wheel looks like to know what I’m talking about. Mine didn’t look exactly like this one but it will give you an idea. Mine was also inside the building running the grinders, it wasn’t a water wheel like this one. Mill Wheel coffee table almost completed. Now that the bugs are out of the base I started the polyurethane coats and applied the same amount to base as the wheel. Hubby helped me put it together and drill the holes for the bolts. Wait a minute, what’s the top going to be. We racked our brains, looked at magazines, window shopped furniture stores and nothing popped out at me. Then Uncle Bill came to visit and was totally awed at what I had done and decided nothing could cover the looke of the spokes, cast iron plate and base and the only top that could be put on it was glass. DUH!!! Why didn’t I think of that!! Uncle Bill wanted to be a part of the project and he bought me a piece of beveled glass 3/8″ thick and pretty little brass L-shaped brackets to hold the glass up off the spokes and plate. We put felt rounds on the brackets so they wouldn’t scratch the glass as they set on top. The entire project was beautiful and the table was perfect for my huge 18 x 32 living room space which also had maple flooring. I was so proud!! Mill wheel in a country sitting. There’s about 2 1/2 fit between the edge of the table and the wood stove to pass through to the kitchen. It’s so easy to decorate for the different seasons and holidays. It can also be a catch all for everything imaginable. I love this kind of project! !